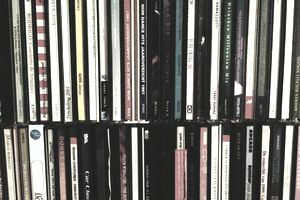 Although the term has become something of an anachronism, digipacks are a type of CD packaging made out of cardstock or other heavy paper material. Digipacks were initially introduced as a packaging alternative to the classic plastic jewel CD cases that still exist today. A digipack can flip open like a book (known as a gatefold), or it can have three parts so that one portion of the packaging opens to the right and one to the left with the CD presented in the center portion. Usually, the portion of the digipack that holds the CD is made of plastic like a traditional jewel (or plastic) case CD, with the plastic part attached to the paper background and cover. Other digipack options exist today that no longer require the inner plastic piece, but they are less common. MeadWestvaco first created digipacks, and their product, called Digi-Pak, is trademarked. As the format became more popular and began to be used by more manufacturers, however, the generic term "digipack" came to be used to describe all soft paper-based CD packaging (much like Kleenex is used to describe tissues or Xerox to describe a photocopier). Digipack-style cases continued to grow in popularity among record labels in the early 2000s. The primary advantage of the digipack was their aesthetic appeal. They looked nice, and many bands and labels liked to use them for their premium feel and design options (To this day, digipacks are often used for single releases and special editions of albums). The three-section digipack sleeves provided more design options with additional space. While they were considered the more premium CD packaging option, they were also more expensive than traditional liner notes and plastic jewel cases. Digipacks also didn't have the same lifespan as their plastic packaging counterparts. Though they didn't crack like jewel cases, they were prone to scratches and rips meaning that they began to show signs of wear much sooner. The paper on the most "well-loved" digipack cases was also prone to peeling apart and separation. The plastic trays in digipacks also broke much more often than in jewel cases. The digipack design did not offer as much protection overall since the outer portion was made of paper, so the teeth that held the CD in place cracked and fell out easily. When the teeth of the tray did break in a digipack, the CD could fall out of the bottom of the paper sleeve because unlike jewel cases, there was nothing else to hold it in place. Digipacks were considered more environmentally-friendly than jewel cases because they could be made of recycled paper. However, they weren't always made that way. Today, there is a renewed focus on environmentally-friendly packaging which has led to some major design changes to the traditional digipack. Digipacks still look great, but if you're just starting out and money is tight, looking for ways to cut your manufacturing costs is essential. Stretching your budget because you like the look and premium feel of a digipack is not a good investment. Consider, too, that CD packaging is unlikely to be high on most up-and-coming musicians' to-do list in the age of digital music distribution and streaming music.